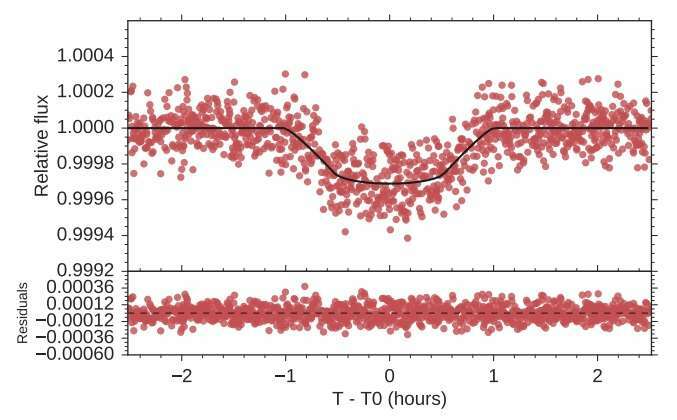 Best-fit light curves to planet K2-106 b. Light curve is folded to the orbital period of the planet. Credit: Guenther et al., 2017. (Phys.org)—An international team of astronomers led by Eike W. Guenther of the Thuringian State Observatory in Tautenburg, Germany, has characterized two "super-Earth" exoplanets orbiting a distant star designated K2-106, determining their size, mass and density. The new findings were presented in a paper published May 11 on the arXiv pre-print server. Located approximately 825 light years away from the Earth, K2-106 is a 5 billion-year-old star of spectral type G5. With a radius of about 0.83 solar radii, the star is 7 percent less massive than the sun. In 2016, researchers detected two planets transiting this star with orbital periods of 0.57 and 13.3 days. Now, Guenther's team obtained absolute and relative radial velocity measurements of K2-106 using five different spectrographs worldwide in order to reveal more detailed information about this planetary system. The new observations show that the two exoplanets have almost the same mass, but orbit at different distances from the host, which makes the system an excellent laboratory to study atmospheric escape processes. "We determined the masses, radii and the densities for the two transiting planets orbiting K2-106, which have been previously found," the paper reads. The researchers found that the planet closest to the star—K2-106 b—has a radius of about 1.52 Earth radii and is about 7.7 times more massive. Therefore, it has a high density of approximately 12 g cm-3. K2-106 c is bigger in size as its radius is about 2.6 Earth radii. However, the planet is less massive—6.8 Earth masses—which gives a relatively low density of 2.4 g cm-3. The team also revealed new information about the composition of K2-106 b. They assume that it is a metal-rich planet with an iron core containing at least 50 percent of its mass. "Ultra-short-period planets forming close to the star should all be iron-rich. Clearly, more research in this field is needed, but the results so far obtained show that studies of ultra-short period planets can give us key information on how and where low-mass planets form. The high metal content of the planet is thus very interesting, particularly because the host star has solar metallicity," the authors wrote in the paper. The researchers noted that the K2-106 is particularly interesting because it hosts an ultra-short period planet subject to a strong stellar irradiation and an outer planet at a relatively large distance from the host star, where the atmospheric escape rate is expected to be low. Thus this system could provide important insights into the formation and evolution of planets. However, many observations are still needed to uncover more details about K2-106 and its planets. "K2-106 is a very interesting system that deserves further studies. (...) The next logical steps are search for the extended, escaping exosphere atmosphere of K2-106 b that has been suggest by Mura (et al. 2011) by obtaining spectroscopic transit observations in a similar way as we have done for CoRoT-7b (Guenther et al. 2011)," the astronomers concluded. Aims: Planets in the mass-range from 2 to 15 MEarth are very diverse. Some of them have very low, others very high densities. Method: We determined the masses, radii and the densities for the two transiting planets orbiting K2-106, which have been previously found. The inner one is an ultra-short period planet with an orbital period of 0.57 days. The outer planet has orbital period of 13.3 days. Results: The two planets have similar masses, though very different densities. For K2-106b we derive M_p=7.69+/-0.82 MEarth, Rp=1.52+/-0.16 REarth, and a high density of 12.0 -3.2+4.8 gcm-3. For K2-106c, we find 6.79+/-2.29 MEarth, R_p=2.59+/-0.27 REarth and a relatively low density of 2.4-1.1+1.6 gcm-3. Conclusions: Since the systems contains two planets of almost the same mass, but different distances from the host star, it is an excellent laboratory to study atmospheric escape. Comparing the mass and radius of the inner planet with composition models implies that it has an iron core containing at least 50% of its mass. Such a high metal content is surprising, particularly given that the star has solar abundance. We discuss various formation scenarios for this unusual planet.